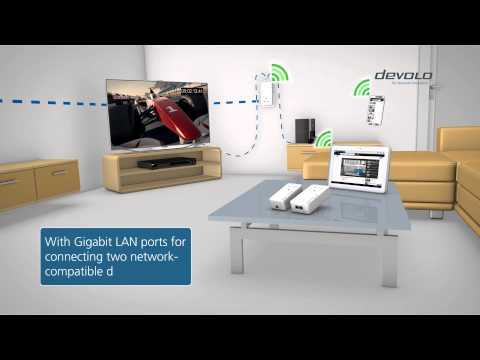 Product Overview With the devolo 9392 dLAN AV 1200+ WiFi AC HomePlug Adapter Starter Kit you can provide your home with a superfast network via the household electrical wiring and experience entertainment at the highest level, thanks to a high transfer rate at speeds of up to 1200Mbps. Connecting your devices to each other is as easy as child's play - from the basement up to the attic, stable and continuous with no signal loss. Furthermore, the integrated Gigabit port provides a direct connection for a network-compatible device. The best part: with the integrated electrical socket (pass-through), no power outlet in your house is lost. With WiFi Sync Technology, devolo has developed a one-of-a-kind technology for the best possible Wi-Fi coverage throughout the home. Multiple Powerline-based Wi-Fi access points set up a building-wide Wi-Fi network, in which all wireless terminal devices such as smartphones, tablets and laptops connect automatically to the access point with the strongest signal. In this way, UMTS /LTE network capacities are preserved and high bandwidths are guaranteed for all digital services. The WPS Clone Mode makes for a particularly easy set-up: At the touch of a button, data such as SSID and password as well as the settings for the child-safety feature and time control are transmitted to all WiFi Sync adapters. • Easy set-up of Wi-Fi zones (Wireless access points) in the PLC home network. • Optimum Wi-Fi coverage in every desired room or every fl oor of the home. The best Wi-Fi connection for smartphones, laptops and tablets. • For the intelligent use of all 3 physical wires in a power circuit to double the data throughput. • The integrated electrical socket ensures that no power outlet is lost! You can connect terminal devices and power strips directly to the adapter. • Automatic encryption! Active protection from unauthorised access at the touch of a button for Wi-Fi (WPS) and dLAN (AES). From the very start! • The exclusive PowerSave technology from devolo provides minimum energy consumption that is continuous, intelligent and entirely automatic. devolo dLAN 1200+ WIFI AC Kit with 2x Gigabit LAN and Dual Band 2.4 and 5 GHz Wireless is rated 5.0 out of 5 by 1. Rated 5 out of 5 by Lalec1 from In door internet Have high speed internet service that comes into a first floor bedroom to a dual band router. Occasional annoying drop out in both bands downstairs with very weak reception in back yard. Seems to happen whenever we are streaming films from Apple or when some important task is being undertaken. This gadget has solved all issues. I have not yet reinforced the WiFi signal by repeating set up on every plug socket as the signal from the box behind the TV is very strong and gives good reception in the garden behind my 3 bed semi. A good buy so far as I am concerned.